Review by Derek Chadbourne, with comment from Allan Sheppard Sr.
Review by Derek Chadbourne, with commentary from Allan Sheppard Sr.
On August 31, 2009, Michael Bryant, former Attorney General of Ontario and his wife, were out for an idyllic evening. They were celebrating their twelfth wedding anniversary. Driving back from the beaches, Bryant witnessed a cyclist throwing garbage and pylons around at the intersection of Yonge and Bloor. The former Attorney General kept an eye on him, worried the crazed cyclist might come after them. As the car stopped at a red light west of Bay Street, the errant cyclist took a swing at Bryant as he rode past, turned and threatened him. Terrified, Bryant panicked and stalled his car. As he restarted the vehicle it lurched forward hitting the cyclist ...three times. The third hit knocking the cyclist to the ground and dragging the bicycle. Bryant reversed off the bicycle and drove away, trying desperately to get away. As the car passed the cyclist, the man jumped into the convertible and attacked Bryant. The car swerved into oncoming traffic, scraped the sidewalk, and then the attacker was gone—knocked from the side of the car when he came in contact with a fire hydrant, then a mailbox. Bryant fled to the Hyatt, a hotel just around the corner and called 911. The cyclist, Darcy Allan Sheppard, father of three, lay on the ground, dying. A terrifying story. Unfortunately, most of this narrative—Bryant's account of events—is false. 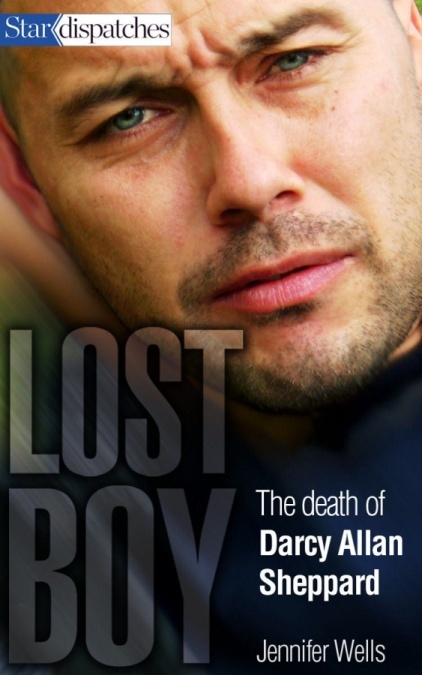 Lost Boy: the death of Darcy Allan Sheppard, written by Jennifer Wells, paints a fair portrait of the trials and tribulations of a lost boy who grew up to be a troubled man. She illustrates the story with vignettes of Darcy’s checkered past, but also shows he was big-hearted and was not the 'crazed courier' who Bryant was apparently so terrified of that night. While the book goes over old ground of Darcy Allan Sheppard being a problem child, being a criminal, and no good on booze, the book does an excellent job of describing what actually did happen that night. While most of this information is public knowledge, what is finally brought to light is that the account of 16 witnesses and a video camera were all put aside in favour of an obscure legal victory from the 1970s, known as the Scopelliti defence. On January 23, 1979 Orillia shopkeeper Antonio Scopelliti shot and killed two teenagers with an unregistered handgun. There were no witnesses. Scopelliti's lawyer, Eddie Greenspan, raised doubts about alleged statements taken by the police and introduced evidence of prior violent attacks by the two youth, including the assault of a driver. In the case for the defence of Michael Bryant, the case R. v. Scopelliti became the foundation of the special prosecutor’s successful request that charges against Bryant be dropped. “The law clearly recognizes, particularly in the context of a case involving a defence of justification that is based on another’s aggressive conduct, that this prior conduct is relevant in considering whether the accused was attacked by the deceased and to show the probability that the deceased was the aggressor,” special prosecutor Richard Peck said in his court statement explaining his decision. Scopelliti, whose gentle, humble and even-tempered nature was maximized by the defence — “He wasn’t even known as a man with a short fuse,” Greenspan wrote of his client — went to trial facing two counts of second-degree murder. The trial judge ruled that the proposed evidence of separate acts of violence or threats of violence be admitted as corroborative support of the accused’s explanation of events. On the night of Sheppard died, August 31, 2009, there were sixteen witnesses and a video camera. According to the special prosecutor for the defence, none of these witness accounts were valid. Instead Peck dismissed charges against Bryant because of six witnesses who supposedly had past dealings with a violent Sheppard. One witness described an incident from back in 2005 when Sheppard was not even a courier and involved testimonies about a man who looked nothing like the man who was killed. There are some details of that night that have never been spoken of, except in Bryant’s memoirs 28 Seconds, published in August 2012. The most glaring is that the Bryants were in fact, not out on an idyllic anniversary dinner, but were instead discussing the end of their marriage, a fact which raises questions about Bryant’s mood behind the wheel of his car that night. Only witnesses at the scene could tell. The Switzmans were out for a walk on that fateful August night . While her husband Steve stopped to light a cigarette, Victoria Switzman stood at the side of the road when a car and a bike moved into her field of view. As the car reversed and raced away, Sheppard grabbed on to the side of the car, possibly to stop the driver who had just destroyed his bike, his only way of making money. Sheppard hung on for dear life as the car accelerated into oncoming traffic. None of the witnesses or police evidence showed Sheppard had touched the steering wheel, but the car inexplicably crossed in to oncoming traffic, wheels rubbed against the sidewalk and first smashed Sheppard into a fire hydrant and then a mailbox Dropping him in the street to die, stone-faced Bryant drove away. When contacted at his home in Alberta and asked how he felt about the book, Allan Sheppard, Darcy’s adoptive dad, who worked for three years to discover the truth of that night, said he was happy with the book. He is happy the book explains the Scopelliti defence, and how if the case had gone to court Bryant’s past would surely not have held up in the same way it had for kind and gentle Scopelliti. He is also happy that there is a public record that, even though it shows all the warts of his son's life, also sets the score straight. If Darcy's kids were only exposed to what was in media reports or Peck’s statement, they might have believed their father was the raging berserker he was portrayed as. It is important for the kids to know their father better. Not that DA Sheppard was a saint; but this remains an injustice, and one that is hard to redress. What would justice for Mr. Sheppard (Jr. and Sr.) look like? The precedent it sets for taking a lane in front of a car at a stoplight is bad for all of us – even when there is video…. Would Bloor bike lanes have prevented this?